Simple activities such as standing, sitting and walking can make our bodies tense and tired by the end of the day. Lunge pose is a low back, calf and groin stretch that releases tension and stiffness in these areas, invigorates the breath and relaxes the mind. Here’s how: Stand facing the seat of your chair. Bend forward and place both hands on the seat. Step your left foot back 3 to 3-1/2 feet. Either keep back heel lifted as shown, or you may also drop your back heel to the ground with toes facing forward or slightly turned out. Bend your front right knee. 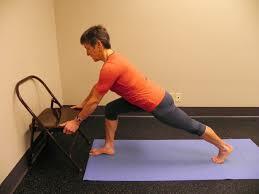 Try to extend your arms long, and aim to lift and lengthen the torso as you lean toward the chair. Feel the balance between the stretched back left leg and the strength building in the front right bent knee leg. Take five full breaths and then switch sides.